For hundreds of years in the Middle Ages the most vibrant city in England, after London, was Norwich. The capital of the most populous medieval county in England, Norwich was the principal market for the goods of East Anglian wool producers. Destined for the Continent, the wool was transferred onto barges and boats for shipment on the Wensum and Yare River to Great Yarmouth and beyond. 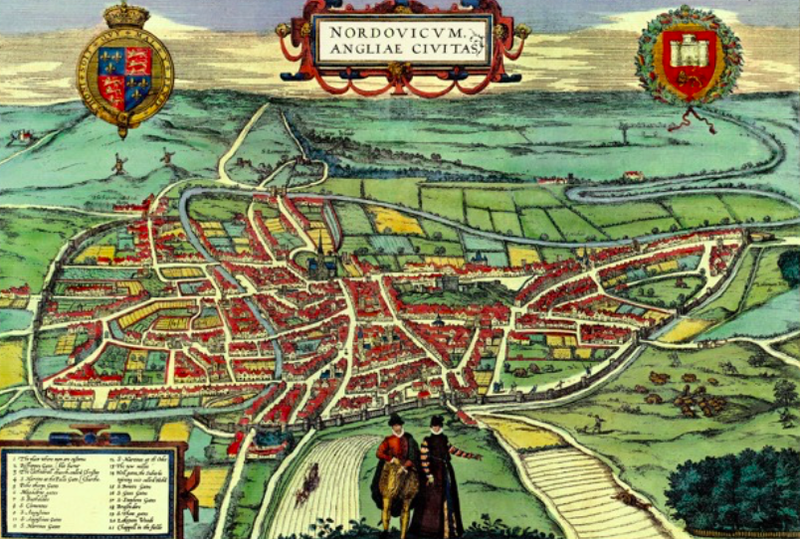 At that time, Norwich had closer links with the Low Countries than with the rest of England. Cut-throat competition for the wealth generated by the wool trade prompted the town burghers to attempt to atone for any dubious business dealings. Driven by a clergy-controlled sacramental system which constantly raised the question, “Are you really in a state of grace?” the burghers deposited great sums in the Church building fund which financed many fine churches and other buildings. Consequently, nowhere else in Britain can one find such a variety of intact medieval buildings: Norwich Cathedral, Norwich Castle, the Guildhall, The Great Hospital, St Andrew’s and Blackfriars Hall- the most complete medieval friary complex surviving in this country, Dragon Hall- a huge and original timber-framed medieval warehouse once hidden behind house facades, and at least 31 extant churches. Nicholas Friend hosts this tour of a beloved city where he taught weekly for three years, sometime ago. We have arranged private tours and special visits to the Cathedral, the most complete Norman cathedral in Britain, with magnificent roof bosses, misericords, stained glass, and the 14c Despenser family Retable. We will also examine the most distinctive ‘wool’ churches, an intact medieval warehouse, and public buildings, including St Peter Mancroft, St Gregory’s for its wall paintings, the 13c Great Hospital, the 14c St Andrews Hall and Blackfriars Hall- the finest friary complex in England, and the magnificent timber framed 15c Dragon Hall. Like skyscrapers in modern urban centres, Norwich’s many soaring Gothic churches jostle one another against the skyline as they compete for both space and glory. COST £1225 Members, £1275 non-Members, £60 single room supplement, £250 deposit, includes three nights accommodation with breakfast, two coffees, four lunches with wine, two dinners with wine, lectures by Nicholas Friend, all private tours and visits, and all travel during the tour, VAT, tips and service. Excludes travel to and from Norwich.